(5 ft 11 in, born June 30, 1986, Guagua, Pampanga, Philippines), is a Filipino-American professional basketball player who plays for the Talk 'N Text Tropang Texters as combo guard in the Philippine Basketball Association. He is also awarded by FIBA as the Best Point Guard in Asia. (6 ft 6 in, born December 8, 1981, Tanza, Cavite, Philippines) is a professional basketball who currently plays for the Talk 'N Text Tropang Texters in the Philippine Basketball Association (PBA). He is the younger brother of Yancy de Ocampo. Both played together with FedEx and Talk 'N Text. He is also a two-time RP Team member. (6 ft 5 in, June 13, 1990, Olongapo City, Philippines) is a Filipino-American professional basketball player who currently plays for Talk 'N Text Tropang Texters as small forward in the PBA. He played college basketball for the NCAA Division II School Cal Poly Pomona. He was recruited to play for the Philippine national basketball team during their 2012 William Jones Cup campaign. He was drafted 4th overall by NLEX in the 2014 PBA draft. His moniker is MGR (his initials) or D-ManaGer "D" is for "Defense". ( 6 ft 10 in, born March 2, 1973, Nuku'alofa, Tonga) is a Tongan-Filipino professional basketball player in the Philippines who currently plays for the NLEX Road Warriors as center in the Philippine Basketball Association. He is the oldest active player in the league and is currently in his 15th season. (6 ft 7 in, born April 3, 1988, Cebu City, Cebu, Philippines) is a Filipino professional basketball player who plays for the NLEX Road Warriors of the Philippine Basketball Association. At 6'7", he plays both the small forward and power forward positions but occasionally plays the center position. Ramos is also a decent outside shooter. He was part of the FEU Tamaraws team who played back to back finals in seasons 73 and 74 against the Ateneo Blue Eagles. (6ft 4 in, born November 18, 1983 in Quezon City, Philippines), is a Filipino professional basketball player. He currently plays for the 07 Barako Bull Energy as Small forward / Shooting guard of the Philippine Basketball Association. He is married to television host and model Bianca Gonzalez. Gabriel Daniel "Gabe" Norwood Also known as "Mr. President"
(6 ft 6.75 in, born February 9, 1985, Fayetteville, North Carolina) is a Filipino-American professional basketball player and a former NCAA basketball player at George Mason University. Norwood is playing for the 05 Rain or Shine Elasto Painters as Shooting guard / Small forward in the Philippine Basketball Association. He is a two-time member of the Philippine national basketball team. (6 ft 8 in 6 ft 8 in, born on December 7, 1981, Port Moresby, Papua New Guinea) is a German-Filipino professional basketball player who currently plays for the Alaska Aces of the PBA. (6 ft 2 in, born June 1, 1977, Cebu City, Philippines) is a Filipino professional basketball player who plays #25 for the Alaska Aces as Shooting guard / Small forward in the Philippine Basketball Association. His moniker is The Cebuano Hotshot. (5 ft 11 in, born March 16, 1992, Imus, Cavite, Philippines) is a Filipino professional basketball player # 07 for the GlobalPort Batang Pier as Shooting guard / Point guard of the Philippine Basketball Association (PBA). He plays both the point guard and shooting guard positions. He played as a point guard for the Far Eastern University before being selected fifth overall in the 2013 PBA draft by GlobalPort. He won the 2011 UAAP Rookie of the Year, was a member of the UAAP Mythical Team during his junior and senior year and was the 2014 UAAP men's basketball Most Valuable Player. (6 ft 2 in, born July 13, 1978, Dinalupihan, Bataan, Philippines) is a Filipino professional basketball player who currently plays #28 as shooting guard for the Meralco Bolts of the Philippine Basketball Association (PBA). He is a three-time All-star and co-holds the longest streak for consecutive games recording 20 points or more. Famously known as El Granada or Mr. Pure Energy, he is widely hailed by fans, legends, and hall of famers as one of the best scorers of all-time in the PBA.He also stars in TV5's sitcom No Harm, No Foul as Gary Da V, alongside Beau Belga, Willie Miller and Kiefer Ravena. (6 ft 11 in, born August 22, 1986, Syracuse, New York) is an American-Filipino professional basketball player who currently plays for the Xinjiang Flying Tigers of the Chinese Basketball Association (CBA) as power forward/center. He played high school basketball at Henninger High School and South Kent School before he was drafted in the second round of the 2005 NBA draft by the Washington Wizards. (6 ft 3 in, born February 4, 1988, Angeles City, Pampanga, Philippines) is a Filipino professional basketball player who currently plays #08, small forward for the Alaska Aces in the Philippine Basketball Association. He was picked second overall by the same team during the 2012 PBA Draft. Nicknamed The Beast due to the all-around threat he brings at both ends of the court, he dominated the nation's collegiate ranks by posting excellent numbers during his tenure with the San Sebastian College – Recoletos Stags in the NCAA. He is the first player in history in any major league in the Philippines to finish as leader in points, rebounds, and assists in one season. 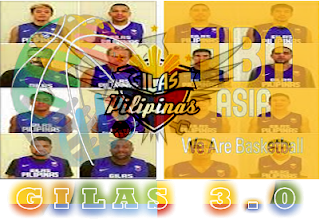 (6 ft 5 in, born April 30, 1989, San Francisco, California) is an American born Filipino-Tongan basketball player who last played for the Cebuana Lhuillier Gems of the PBA D-League. He is drafted 1st overall in the 2014 PBA D-League draft by Cagayan Rising Suns. (5 ft 7 in, born December 30, 1977, San Bernardino, California) is a Filipino professional basketball player He is known to his nickname as The Mighty Mouse because of his small stature but plays with a mighty heart in the game. The 6 ft 7 in, Jeth Troy Rosario known as Bulldog Prince.